It’s been very, very, busy around here lately. In less than two weeks, we’ll be getting possession of our new house. Yes. Even a DIY-maniac like myself get those uneasy, nervous, knot in my stomach type of feelings. The amount of work we are about to tackle in this new home will be our biggest reno project yet. It’s kind of a big deal for us since we don’t know what to expect. Our previous home renos were done one at a time on a much smaller scale. This time around, it’s a bit different. So let’s jump into the details shall we. . .ladies and gents, welcome to The Mod House Project! As you will recall from my images in my last post, this dated home needs a little TLC. The plan is to make a décor transition from 1990 to 2014 with a few modern day upgrades. I will be dividing this project into multiple phases which will (probably) be completed over the long haul. Today, I will introduce to you Phase One! 1) Rip out the floor. Everywhere. Our two-story home is covered in carpet and tile with the exception of our family room which is in laminate. We have to get rid of the carpet immediately due to the hubby’s dust allergies. 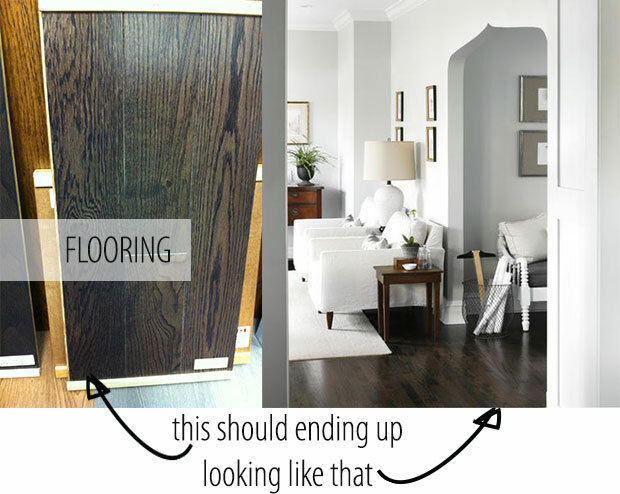 In our past homes, we only took out the carpeted areas and replaced it with hardwood. This time around we decided to switch it up and update the entire house with new flooring. The idea came to us during our house hunting days. We went to see a few new builds and noticed a common trend we saw in each model home—hardwood floor throughout the house. We both loved the look. The appearance is much cleaner, spacious and sets just the right tone. So we thought we’d do the same in our new home. We’re going for a rich warm coloured hardwood floor called Charcoal. Replacing the kitchen wasn’t in the original plans but it is now! This current kitchen has maple cabinets which are still in good condition. When we bought the house, my design solution was to just refinish the cabinets with a new paint colour and replace the curved island with a straight one for better traffic flow into the kitchen and family room areas. However, after looking at some kitchen options, we decided it might be easier to just replace everything with a new Ikea kitchen. I couldn’t believe how nice they look and how affordable they actually are. We were sold instantly. Plus the Ikea kitchen event is going on right now. Bonus! With brand spanking new floors in the house. We can’t have this. . . This carpet will also be ripped up and replaced with an oak staircase. Actually here’s a great example of my first planning mistake. I really did think we could just go to Home Depot and buy new stair treads just like that. I even created my budget around it. Unfortunately it didn’t occur to me until I actually started to shop around for stair treads, that a curved staircase requires custom made treads which = more of this $$$. Damn it! 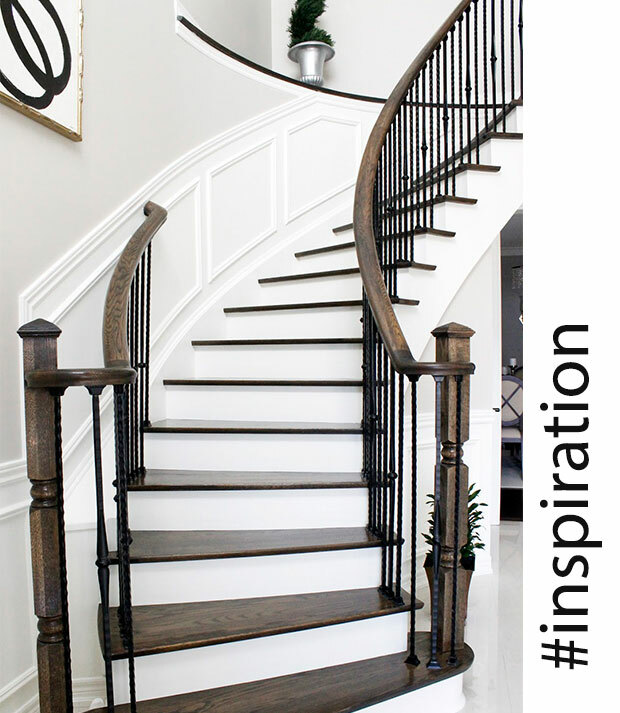 As I’m still trying to determine the best way to tackle this staircase without increasing our reno budget, I couldn’t help but stop and visit Pinterest land for a little inspiration. I came across this curved staircase from Michelle of AM Dolce Vita. Isn’t this gorgeous?! I’m determined to create a stunner just like this! So that concludes phase 1 at The Mod House Project. Can you see why I sometimes stay up at night?! I have no clue how long this is going to take us to complete. So get comfy, it’s all about to start. 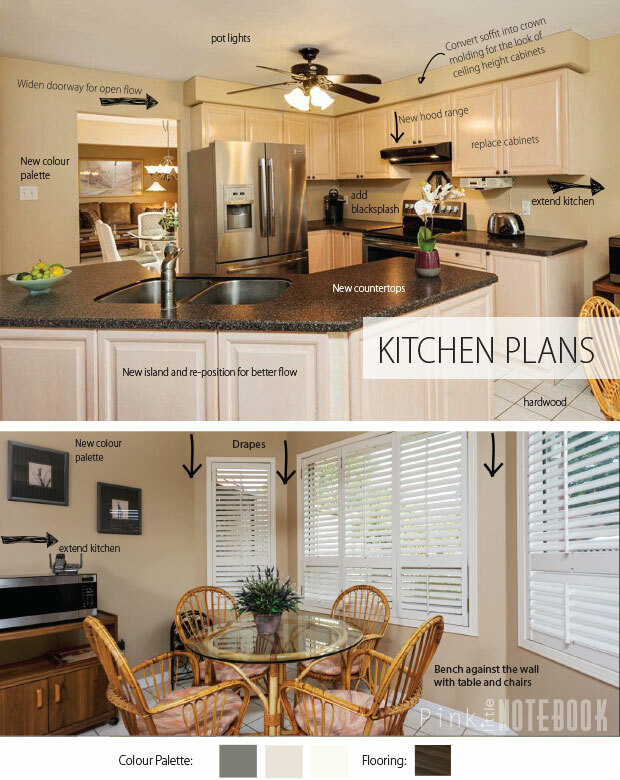 . .
Do you have any home renovation tips to share? WOW!! Huge reno plans for the new house! Can’t wait to see it all unfold. Your new place looks like it has so much potential. Love all of the inspiration pics. 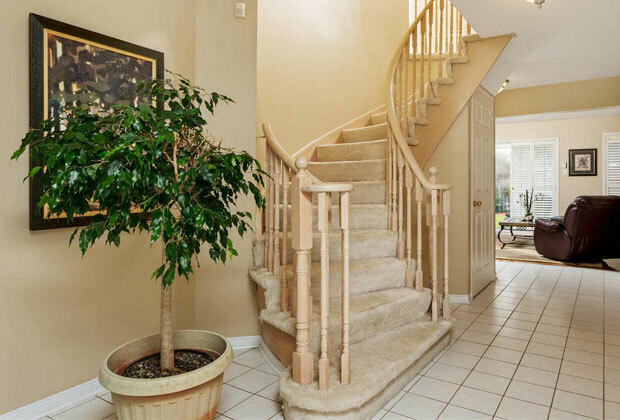 And that staircase is GORGEOUS! Thanks lady! I’m excited and scared at the same time. A lot of work ahead of us! You have more guts that I do. I only like to tackle one room/area at a time! I saw that Mere! These Ikea events are awesome!! Luckily we don’t have to replace the appliances so we get to save a little money there. Congratulations! Best of luck with your beautiful new home. Thanks for sharing. Wow! So much to do, but it is going to look amazing! I hope you’ll share as it progresses! Thanks for stopping by Alaina! I will definitely be posting every detail of the new home! You are definitely a brave soul! Lol. I’m not organized enough to do any of that, especially myself. Major props, major props ha. Wow you have a lot of projects in the works. Can’t wait to see how it all goes.